Losing your ability to walk must be terrible but fortunately there are some masterminds who have devoted their lives to invent gadgets to ease the everyday life of these misfortunated. 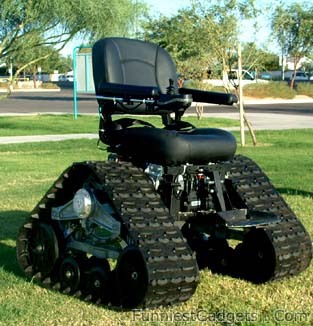 Tank Chair is a Custom off-road wheelchair that can go anywhere outdoors. Conquers Streams, Mud, Snow, Sand, and Gravel, allowing you to get back to nature, and can also climb up and down stairs. Very cool!!! i cant wait till i grow old and get a wheelchair just like this one!!!!!!!!!! !